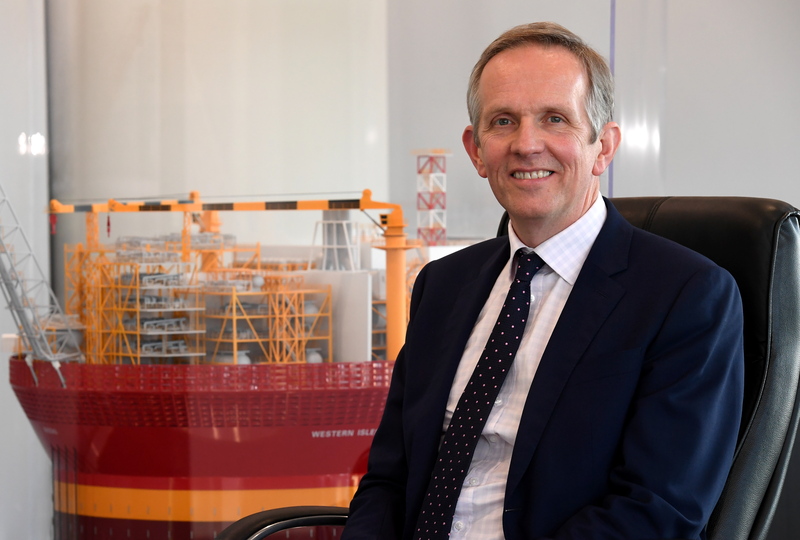 Alan Curran, chief executive of Verus Petroleum based at the Silver Fin building, Aberdeen. Verus Petroleum chief executive Alan Curran said PE was a “force for good” and that too many people associate the funds with shady characters from Hollywood films. Mr Curran is convinced the mature UK Continental Shelf (UKCS) will be strengthened by a new group of PE-backed firms ready to maximise economic recovery and generate revenue for the country. “Everyone needs to park the Hollywood image and understand the reality,” Mr Curran said. “The problem is that many people do not understand what PE is about. “They get The Wolf of Wall Street in their heads. The image is bad, but there are different types of PE with different characteristics. “We have a single investor in HitecVision, but some might have two or three. “PE is just another form of finance. Public limited companies have hundreds or thousands of investors, but most are faceless. Mr Curran said he was working with Oil and Gas UK (OGUK) to improve the understanding of PE within the trade body, and throughout the sector. He said the organisation had “done a good job” over the years, but had to keep up with industry, or risk becoming “irrelevant”. From what he has seen and heard in recent weeks, Mr Curran’s impression is that OGUK is determined to “move with the times”. He said: “If I have a criticism, it’s that views are dominated by majors’ opinions. Majors are paying the bulk of the bills, but as a trade body representing a broad cross-section, the views and opinions should not have been so dominated by a few. Mr Curran, a former petroleum engineer at Shell, said he was “excited” by what he described as a “changing of the guards” in the North Sea. Large corporations are either exiting completely or selling chunks of their portfolios, while a crop of smaller, aspiring companies are entering the fray, ready to take the UKCS forward. Now is the time to “reshape” the industry and build the “right type of companies for the 21st Century”, he said. Verus, which recently moved into the Silver Fin building on Union Street, Aberdeen, has secured a number of acquisitions in recent years. The firm was launched by Norwegian PE firm HitecVision in summer 2014, just before the oil price went “plop”. The emphasis in the fledgling years was on survival and tidying up the portfolio it had inherited from former HitecVision firm Bridge Energy UK. Verus came through those trying times with its reputation “intact” and started to build up the business in 2016. Its first transaction was completed in January 2017 when it bought an additional 9.8% interest in the Boa field from Maersk Oil, taking its total stake to 11.35%. That deal convinced the team at Verus that they could “make it”. Verus had a lot of “near misses” in 2017, but that only stiffened its team’s resolve. Success followed in 2018 with the acquisitions of 47% of the Babbage gas field from Premier Oil and 17% of the Alba field from Equinor – both announced in April. The company’s “big deal” followed in September, when it struck an agreement to buy Cieco Exploration and Production (E&P) UK from Japanese corporation Itochu for £300 million. It gave Verus interests in the Western Isles and Hudson projects, operated by Dana, and added production of about 11,000 barrels of oil equivalent per day (boepd) to the portfolio. Verus also received stakes in the Brent pipeline and Sullom Voe Terminal in Shetland. It means Verus started 2018 with a production profile of about 1,500 boepd, but finished the year on 18,000. Three acquisitions in one year sounds like a lot of work, but Mr Curran said Verus “maintained its discipline” and “walked away” from a number of deals. He also said it was “ridiculous” that the Alba deal took until November to complete, despite the deal being signed in spring. He blamed slow progress on bad behaviour in the “Alba joint venture”, but said the Oil and Gas Authority had helped remove “log jams”. “It’s unfortunate that we had to go to the headmaster, but that’s what they are there for and they delivered,” he said. Verus’ starting strategy was to build up a portfolio with an emphasis on production, creating a solid foundation. That phase of Verus’ growth has been accomplished, Mr Curran feels. He is confident Verus now has the balance sheet and cash flow at its disposal to take on the risk of development opportunities in the North Sea. Mr Curran described Verus’ 20-strong workforce as “deal-making team” which is always on the lookout for opportunities. “We look at more deals than we complete, for sure,” he said. “But we are very precise about the type of target we’re looking at – that’s a feature of PE. The businessman also reckons the Brent crude price slump in the fourth quarter of 2018 was “great” for the market. Mr Curran said: “A lot of froth was coming back into the market when the oil price was rising last year, and there was a concern that bad behaviours might return. “The oil price going down means we have a chance to set up the right business models in the UK and provide a vibrant future. While “hotspots” of good behaviour and collaboration emerged during the last downturn, the industry has not been “transformed”, he said. The dominant trends were negative. There were sweeping redundancies and the supply chain took a “beating”. Mr Curran said: “If we can establish a quality relationship with the supply chain we can take a long-term view and move away from boom and bust. “The UK has been able to withstand these challenges, but as the North Sea gets older, its ability to recover declines.